Each week we'll feature one staff member here on the ePS blog. We believe that not only do our staff members deserve recognition for their hard work, but it's also important for our members to know who we are. This week's staff feature is Erin Olsen, Assistant Manager at Color Sign Company, the offshoot of ePropertySites that handles all of your sign and printing design and requests. Why we love Erin: If you look up the word ‘adorable’ in the dictionary, you’ll find a picture of Erin. Not only is she incredibly organized and efficient, her demeanor is consistently positive and sunny. All of us rely on Erin for her kind professional support. Why you should love her, too: If you have a question or comment about any sign, business card, or other print order you’ve placed through ePropertySites, Erin has most likely assisted you. She is the embodiment of the phrase “on top of things”, dealing with issues that arise in a lightning-fast and compassionate manner. Her generous spirit filters through every customer interaction, and countless ePropertySites members have benefited from her collaboration. 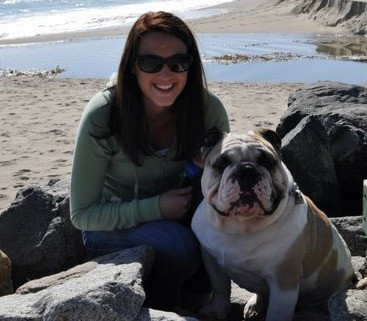 In case you’re wondering, that handsome fellow in the photo with Erin is her trusty companion, Tucker. What a smile! Erin, what is the most daring thing you have ever done? "I think the most daring thing I have done would be packing up everything I have to my name and moving to California. Leaving my family behind was the toughest thing I have ever done, but I love living at the beach so I don’t regret it one bit. Plus all of my family loves to come visit me down here… who wouldn’t want to?" "'Live each day as if tomorrow were your last.' Something I always have in the back of my mind. You never know what tomorrow can bring!" If you won the lottery, what's the first thing you would do? "I would buy my mom, dad, and brother a house- in California, of course! And then take a trip to Costa Rica or maybe buy season tickets for the San Francisco Giants behind home plate." "I love Christmas time. I love seeing all of my family and friends and going back home to Washington where is it really cold and possibly snowing. Makes for a very festive holiday season!" "My favorite ePropertySites moment happened with my Color Sign Company team. It was when we went to do an OCAR (Orange County Association of Realtors) beach event down at Doheny Beach in Dana Point. We had so much fun there. Plus, just being at work each day always brings entertaining things! Thank you, Erin, for all of the amazing support you provide for everyone each day!